Discussion in 'November 2018 Challenges' started by AnneofAlamo, Oct 23, 2018. Hello! November is my birth month! I am gonna hit 55 this month! I am so excited about hosting a challenge! This inspiration has been in my folder since before last years Month Of Challenges (prepare yourself the MOC 2019 is around the corner). What I love about these advertisements is the starkness, and possibility of an extraction, (you do NOT have to DO an extraction, but golly what fun). The way you could take words, I love playing with sizes of titles, journaling and fonts. So, give it a whirl, try and be inspired from the ad, stretch yourself and your pages. And as always: your page must contain at least 75% current Lily Pad product. (“Current product” is product created by Lily Pad designers who currently sell in the store. If it has a working store link, then that's a current product.) 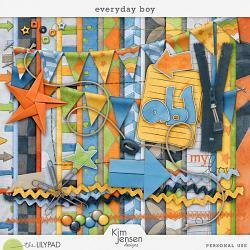 Your page should be posted to the Lily Pad Inspiration Gallery, the November Challenge Layouts thread (so it can be tracked), and to this thread. If you complete 7 or more challenges, you will receive a coupon for 30% off, plus you will be entered to win a $50 Lily Pad gift certificate! Iowan, Ga_L, umyesh and 3 others like this. I'm going to take this spot, right here. Such great inspiration, Anne! I was inspired by the large photo with a single subject and the font work. I used this inspiration to make a start page for my album section about the Pixar Play Parade from our most recent trip to Disneyland. Thanks for the challenge! What a great challenge, Anne and I love your example layout of the boys running!! bjc, Thuria, Carol K. and 2 others like this. meterr, Electra, Cherylndesigns and 2 others like this. I went with extraction & typography! Fun challenge!!! Iowan and AnneofAlamo like this. I was drawn to your LO when I saw it in the gallery. This will stretch my 'comfort zone', but what a great look! OMG! I love this inspiration!!! Hmmm. I haven't done an extraction in a long time. It might be time for me to try again! Thuria, wvsandy and AnneofAlamo like this. Thanks to Roxana for inspiring my word art! Shamelessly lifted! meterr, Thuria and AnneofAlamo like this. Inspired by the white background with models in pops of color and mixed font types. wvsandy and AnneofAlamo like this. So this photo is from a few years ago. Sadly it is not like this as my daughter is 17 nearly 18.
wvsandy, AnneofAlamo and A-M like this.